The subject about which, by the grace of God, I intend to speak to-day, is the perversion of this age in which the enemies of God and of man confuse the minds, corrupt the morals, undermine religion, and, rending asunder all bonds, seek to overthrow Divine and human order. It is the spiritual blindness of so many who attack Christianity, preach vice under the name of virtue, allow themselves everything with lawless audacity, proudly disregarding every authority, mislead the innocent, who poison the spirits and murder the souls. It is the deadly unbelief and the religious indifference which denies everything Divine and holy, the indifference, which is lukewarm and cold toward all that is good — this it is that troubles my heart and fills my soul with pain. The greatest evil in the world is unbelief, the apostacy from God. This apostacy from God is the continual source of corruption. This is a law of the eternal justice. For the man who falls from God and recognizes infidelity is nothing more holy; for him ceases everything that religion highly esteems — family, property, father-land. A nation in which skepticism gains the dominion is sure to meet perdition. Unbelief undermines all foundations of society, till finally regarding neither divine nor human authority it seeks seeks to upset everything existing. Thus teaches the history of all times. Was it not during the rule of the Commune in Paris, as if there the angel of the Apocalypse had opened the abyss from which ascends scorpions? Was it not the lot of the Prince of Darkness to plunder and murder; was it not a picture of unspeakable misery, which there unfolded itself under the red, blood-steeped banner? God permitted for a short time of t his unlimited rule, in order to remind the nations again into what abyss apostacy from God does lead, and how everywhere, at all times, the truth of the law of eternal justice does stand, that unbelief is the source of all evil, and the end of corruption. “The letter killeth, but the spirit giveth life.” This eternal truth appears very clearly, when one considers more closely the watchwords and phrases of unbelief, and compares with them the deeds which were seen as the last consequences of the same in the days of the Parisian Commune. The devil is only the ape of God; he knows no other inducements to allure to his kingdom than the promises which the Lord has made to His believers, only that he explains them in his way, and thus turns the divine truth into a lie. Man was created in the image of God, and “ye shall be as God,” were the words of the first temptation of the serpent, but it led, through sin, to corruption. To the Son of God was promised dominion over the world, and the devil endeavored to seduce Him through the promise of “all the kingdoms of the world, and their glory.” The same value have the promises of the Internationalists and the communists. They incite men to their service through all that which God has named as the prize in His service. “Liberty” is the first watchword that resounds from the ranks of these enemies of order and government, and the glorious liberty of the children of God is also the reward of those who follow the Gospel. But the evangelical liberty is freedom from slavery of sin, from the power of death; it is the sonship of God. The liberty at which the Internationalists aim is the despising [of] the commandments of God, the self-willed separating from His ordinances upon earth, as Church authority, family — these all are instituted to bring man into the service of God, or to preserve him in the same. “Equality” proclaims the Internationale to its adherents eager after unjust good and enjoyment, and agreeably falls the word upon the ear of the envious multitude. The equality of men is also the doctrine of Christianity. All men are equal before God; all were created alike in His image; to all has appeared the same salvation. The equality of the Commune is the claim alike to the enjoyments of the world, possession, power, and the gratification of the passions. The desire after this equality is the opposite of the commandment, “Thou shalt not covet.” The motives are envy, disloyalty, and indolence, and the way to satisfaction is the putting aside of every authoritative order, the plundering of those who hold possessions, and the emancipation of the flesh. “Fraternity” is the third word upon the red flag — the beautiful battle-cry also of the Christian. The children of God are brethren, and are to be of one mind and soul, and to communicate among themselves that there be none among them that lacketh. The common love of man becomes among Christians brotherly love, and the standing salutation of the Apostle, “Beloved brethren,” is the language of every Christian heart. But what does the Commune understand by “fraternity”? The answer was given to the world in the howling of rage and murder, of petroleurs and petroleuses, even the names of which point to crime, because only the Commune had invented them. The abuse of those words shows us that words in themselves are dead, and receive life only by the spirit that enters into them. “Liberty! Equality! Fraternity!” Only Christianity gives us the true meaning of these words, and never have the greatest philosophers of the world so highly spoken about the relations of men to each other as Christ has taught and His Church proclaims. The Christian Church with her doctrines and sacraments is, in this respect, to become the leader. She is the medium whereby the Divine life is communicated to each human being, in order to complete the Divine image in him and to unite him most intimately with God. Continually must we cherish the desire to be more and more in unity with the eternal, infinite Deity; and this bond of men with God will then also unite mankind into one family, and make them beloved children of God. That is the meaning of liberty, equality, and fraternity, in the Christian sense. If we look around us, we cannot fail at the same time to perceive how religious indifference in so many families has also disturbed the Christian life. That faithful, pious mind, that strong trust in God, that content, experienced in former times, have severally disappeared. Acquisition, gain, employment are often the first items in the home, but the last is religion. Prayer has disappeared — nothing more is known of a lifting up of the soul to God. The cares of the body reign over all — religious indifference rules the home. Business flourishes, the master of the house is esteemed, the lady of the house is courted by society, but are we not deceived? The good fortune of such a family is only in appearance, and treacherous, because it is without a foundation. How will it be there when the plays of misfortune and sadness appear? How will it be there when the blessings of this world forsake such a house, for God’s blessing was never sought? Even if the children are so educated as to understand how to acquire with skill the goods of this world, can they endure the trials which life imposes upon them? Will they approve themselves in the hour of temptation, when sin with her seductions approaches near; when the excitement of vice decked with flowers misguides them, when the advantage of chrime blinds them? Surely not. On the contrary, the certain end of an education without religion and the fear of God, will be that they do not approve themselves. And suppose it were not so; suppose God suffered such a family and their children’s good fortune until the end in the full enjoyment of earthly goods, because their whole heart was attached to them, yet this end must be at the last. Then such a family shall know by experience that they have sowed to the earth, also reaped only from the earth, for heaven they have done nothing, and shall also receive nothing. How often one meets in families a lukewarmness which stifles all Christian life. The faith is dead, the will without power; cold and indolent is the exercise of religion, the life spirit is vanished away. But the exterior practice of religion is nothing without a union with the inner, spiritual. The spirit giveth life, but the flesh profiteth nothing. However many lights may be burning here in this chapel, and however beautiful the robes of the clergy appear, that will be of no avail either to me or to those that are present, if we are not converted unto repentance. Let us above all not forget prayer, this bond which joins in a mystical manner mankind to God, and the Saviour, who for us all died on the cross, will, let us hope, have mercy on us. For we are all bought with the blood of Christ; we are all to attain to the possession and the vision of God, to drink of the well-spring of eternal love and bliss. 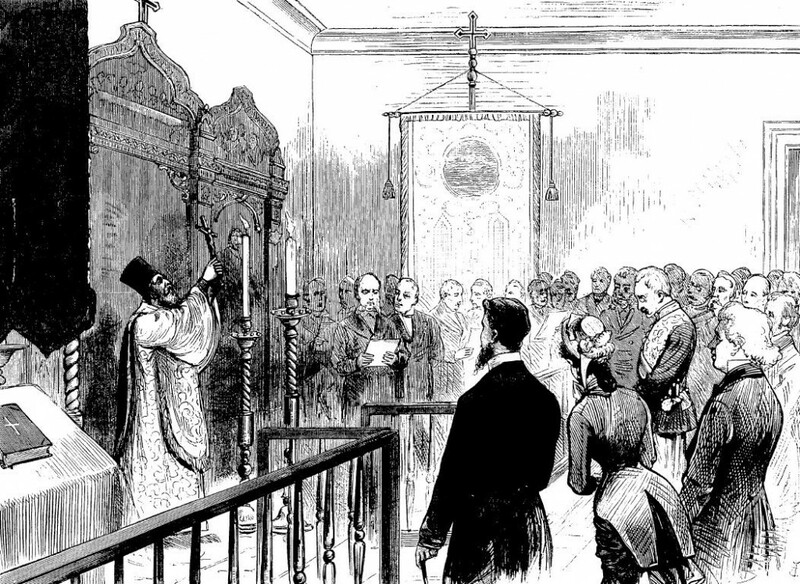 May we not forget this final object, but when we celebrate upon our terrestrial pilgrimage the Christian mysteries may we, looking for that heavenly home and spirit, exclaim: “O God, grant us that we may yet be filled with the enjoyment of thy Divinity, whose presence we here celebrate in the reception of thy body and blood.” Amen.